Check out these extras that are available around the Expo Hall at Strata in New York. 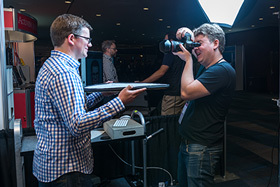 Update your professional profile—Get a new headshot at the NetworkIt Lounge with our friends from Two Dudes Photography. Looking for networking opportunities? Check out the message boards and other activities in the NetworkIt Lounge to organically connect with attendees at the conference. Stop by on Wednesday and Thursday at 3:45pm for afternoon Speed Networking sessions. 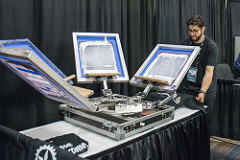 Visit the O’Reilly booth for details on how to pick up your custom screen-printed official Strata T-shirt. 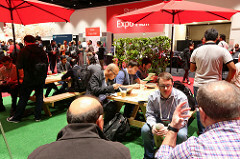 Pop-up Talks is an “unconference” within Strata—an open, community-driven format where you can connect with other attendees on topics that you want to discuss. Strata Park—We’re bringing the outdoors in. Enjoy fun outdoor seating in an indoor setting at the Strata Park. Crypto Fountain—Fountains connected to currency rates on the internet represent changing values of cryptocurrency in real time. Detecting Emotion Using Emoji—What does your emoji say about you? Check out a demo of a deep learning–based real-time face detection and emotion recognition system. Using an off-the-shelf camera and NVIDIA DGX Station—the world’s fastest personal AI workstation—NVIDIA engineers capture and analyze dozens of faces and emotions at the same time. The system then displays people’s emotions using emojis. The demo can recognize eight different emotions: neutral, happiness, surprise, sadness, anger, disgust, fear, and contempt. Teaching Cameras to Read Body Language—wrnch, a Canadian-based AI startup, demonstrates a real-time deep learning software platform that can read body language from standard video. Using an off-the-shelf Logitech webcam, the team can track and capture human motion without the use of special cameras, bodysuits, or sensors. The team uses NVIDIA Tesla V100 GPUs and the NVIDIA TensorRT inference optimizer for its AI engine. wrnch is a Mark Cuban-backed startup and a member of the NVIDIA Inception program. The company was founded by Paul Kruszewski in 2015.